Rock flour is the finely ground remains of rock. It is produced by the grinding of rocks against eachother, particularly where the rock studded base of the glacier moves across the valley floor. Other, less significant, sources of rock flour from within the glacier include fine material produced by freeze thaw processes, and debris / dust falling onto the glacier from the valley walls. 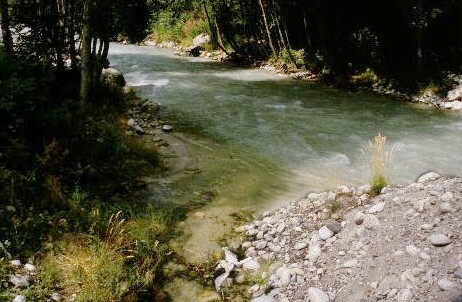 Rock flour is removed from the glacial system by meltwater streams which carry an assortment of debris of various sizes. The flour, being very small particles, can be held in suspension long after larger particles have been deposited, and thus can colour a meltwater stream considerable distances from its origin. The typical clue to the presence of rock flour is a milky blue/white colouration of the water. When samples of water are examined in a glass jar, the tiny particles can be seen swirling around like flecks of dust. Fresh water entering a meltwater stream rich in rock flour. In the picture above, the main stream is draining meltwater from the Mer de Glace glacier, and is about to enter the village of Chamonix several kilometers from the glacier snout. The water is cloudy blue/white, showing that it is rich in rock flour. On the left side of the image a fresh water tributary, containing no rock flour, can be easily distinguished by the clarity of the water.